This hymn about happiness and right-living was written by South African born lay Franciscan Sebastian Temple (1928-1997). It was the title-track of an LP released by Franciscan Communications in 1967 (ref). A music-book for this was published by GIA Publications, and this is still available from Sheet Music Plus (link below). It is set to an unnamed tune, also by Temple. This has a 4/4 time signature. In the key of C, the first few notes are E E G C_ C DEFD E-D, with accompanying chords C / Am / Dm / G7. 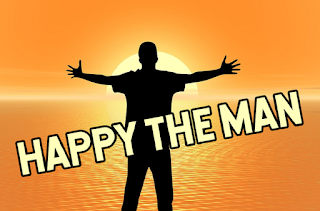 Song-book for the Happy the Man album, arranged for unison choir and guitar. Happy the man who wanders with the Lord. Giving because he loves to give. Happy the man whose service needs no pay. Happy the man, happy the man of the Lord.